My name is Doshi, the captain of the Gnarly Beach Cleaner (GBC) crew. I am a surfer who is passionate about the ocean and I am compelled to show people how easy it is for us all to make small changes in our daily lifestyle to positively impact the natural environment we live in. I want to teach people to live in the present, with undertones of longevity! Gnarly Beach Cleaner is based in Venice Beach, California, and through social media, we have aligned with a worldwide Instagram community of marine activists, wildlife lovers, and beach cleaners. Through pure fun and positivity, GBC creates consciousness about plastic pollution and the side effects caused by single-use consumer goods. To view our light-hearted content and smiles, check us out on Instagram @gnarlybeachcleaner . It is estimated that by the year 2050, there will be more plastic in the ocean than fish by weight. This is one of many alarming statistics that require worldwide action for change. With plastic pollution being such a major problem in the ocean, GBC has taken the optimistic approach by instilling the #makeitfunmovement to help solve the problem! For more information on marine debris, click here . 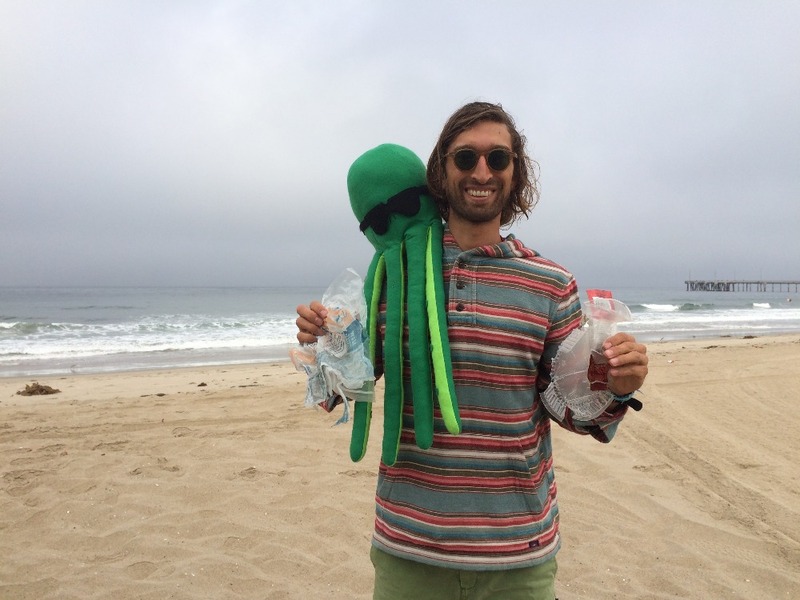 Gnarly Beach Cleaner is raising money to send our freshly-fabricated stuffed octopus (and mascot), Gnar Gnar, around the world to help spread awareness of ocean pollution, and remind people to have fun while cleaning the beach! The octopus is constructed of sustainable materials: Wool felt (top body), Eco-fi (under body made from recycled plastic bottles), 100% organic raw cotton fiber (filling). The plan is to start the Gnar Gnar's world tour by sending it to some of our amazing Instagram community, bringing GBC’s digital connections into the physical form, like a modern day pen pal! We want people to take photos or videos with Gnar to post on social media, while enjoying the company of the good vibes our 8-legged friend brings. The money raised all goes towards the cost of the project, including all shipping and handling charges for the octopus. GBC will transfer funds internationally to those individuals who will be handling the coordination of shipping the octopus to the next location. We plan to send the octopus on its way starting in October, with a proper preceding launch party at the beach to send it off in style! We have created a passport for Gnar Gnar, so people can add their favorite beach cleaning stories, photos, or messages to the next person that will be receiving Gnar. We will be permanently stoked for whatever amount you can donate! Whether we reach our goal of $1,800 or not, we will send the octopus with whatever money we have raised. Thank you in advance for wanting to create change in our world and for helping to protect the ocean for all living beings! first stop, San Francisco ... happy to stowaway your 8 legged friend on a ladies trip to Hawaii early October to visit the Islands, then safely send it on its way to places unknown ... #take3forthesea perhaps? Heck yes! 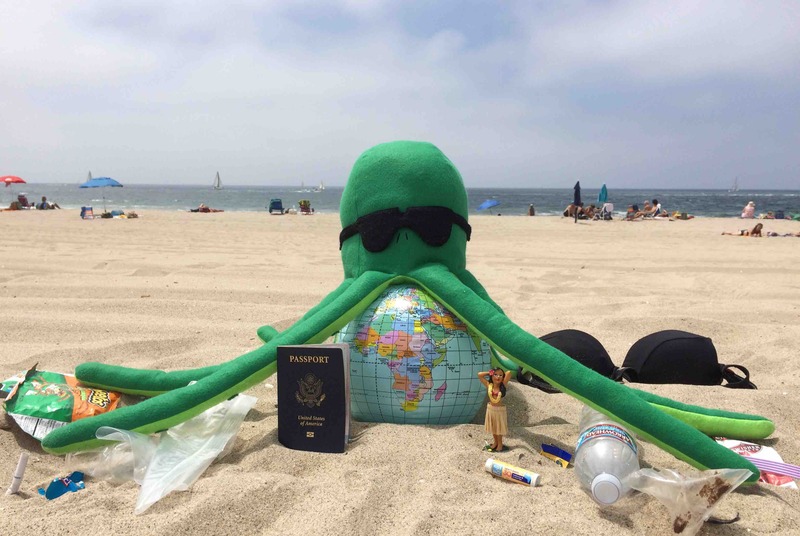 Let's send that octopus around the world and keep plastic out of the ocean! I got your back, homie! Seems to me that the ONLY way to accomplish a goal like this is... to make it fun!!! Way to go, Michael. I'm smiling -- can't help myself.